In a world that often seems dark and full of suffering and violence, Christians can offer hope by sharing the Gospel of Jesus Christ, Pope Francis wrote in a message for World Mission Sunday 2013. “It is necessary to proclaim courageously and in every situation the Gospel of Christ, a message of hope, reconciliation [and] communion, a proclamation of God’s closeness, his mercy, salvation and a proclamation that the power of God’s love is able to overcome the darkness of evil and guide us on the path of goodness,” the pope wrote. The message for his first Mission Sunday since becoming pope is filled with phrases and ideas that featured prominently in the speeches and homilies Pope Francis gave during the first four months of his pontificate, including at World Youth Day in Rio de Janeiro. Pope Francis’ message emphasized the obligation of all Christians to share the faith with others and do so with respect. He also pointed to the stifling damage done to the Church by the failure to evangelize and the sacrifices made by many Christians around the world currently facing oppression or even persecution because of their faith. “If we want to keep it only to ourselves, we will become isolated, sterile and sick Christians,” the pope wrote. 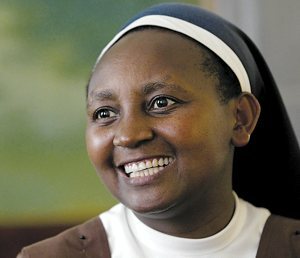 Pope Francis said he knows some people today hesitate sharing the faith because they somehow think it will limit other people’s freedom, when in reality faith empowers people and frees them from despair and from chasing pleasure or material possessions that cannot last and, therefore, cannot make them happy forever. They are “courageous witnesses” of the Gospel, he said. Pope Francis’ message also was filled with praise and thanksgiving for priests, religious and laypeople who have left their homelands to spread the Gospel. He urged all Catholics to take responsibility for the church’s missionary activity, including by giving financial support to the Pontifical Mission Societies. « How are you being called to join in God’s mission?